Who doesn’t like pasta? 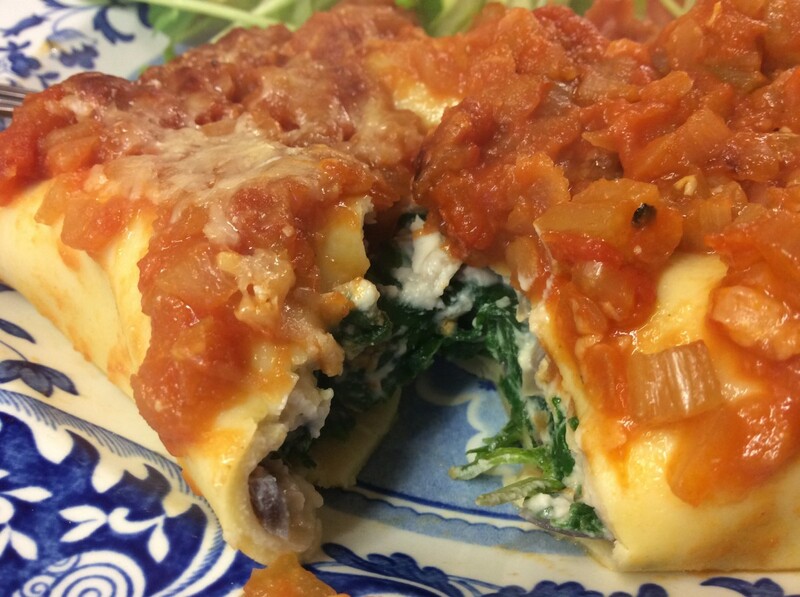 And when it’s got a melting spinach and ricotta filling and a chunky tomato sauce on top AND it’s easy to make it seems even more lovely. The recipe can easily be altered but i find it easiest to make a batch and freeze any leftovers for another day. The lentils in the tomato sauce just add a hit of protein for us vegetarians, but aren’t strictly necessary and can be omitted. Heat a large frying pan and cook the onion gently in the rapeseed oil until softened. Add the garlic and cook for a minute, then turn up the heat and cook the spinach quickly for 1-2 minutes until wilted. Stir through the ricotta cheese and a really good grating of nutmeg. Season and set aside to cool. Sweat the onion, celery and garlic in a large saucepan with the lid slightly ajar until softened but not coloured – stir occasionally and if sticking, add a splash of water. Add the tinned tomatoes, sugar, stock and red lentils and stir well. Bring to the boil then simmer until the lentils are cooked – about 15-20 mins. If the sauce is really thick it may be necessary to add a little more vegetable stock. If you like a really smooth sauce, whizz it in a blender, but I prefer it chunky. Fill a large flat Pyrex dish with boiling water and place the lasagne sheets in, moving them around to prevent them sticking. Soak for 3-5 minutes until pliable, then lift out, spread out and dry on a flat, clean tea towel. 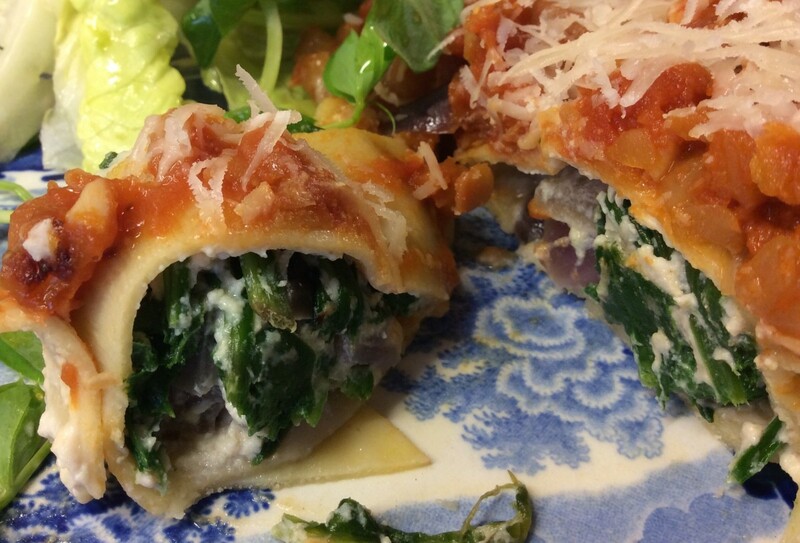 The sheets can then be easily rolled and used in place of cannelloni tubes. Place a dessert spoonful of the ricotta mix on the end of each pasta sheet, then roll and arrange in an oven proof dish. Pour over the tomato sauce and add a generous layer of grated parmesan on the top. Bake at 200c for 25-30 mins. Serve with a green salad and garlic bread.